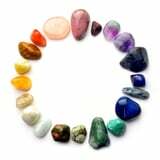 The very pretty semi-precious gemstones have been used for centuries to heal and promote good health. Their good energy can alleviate stress, headaches, improve mental clarity (which is great for the tad forgetful) and can even help you get a better night’s rest. We’ve collected 10 of the best, so click inside to see how they can help you.